'Robot' is certainly one of the first South African slang words you will hear when you come to South Africa. What South Africans call 'robot' is actually a traffic light. If somebody gives you road directions saying 'turn left at the robots' that means that you have to turn left at the next intersection with traffic lights. You might also see road signs such as 'Robots ahead'. What is a bakkie? This is a South African term for a pick-up truck, utility vehicle or light delivery truck. The cabin is usually small and carries only two or three passengers, while the back hold is open for easy loading and transport of nearly everything you can think of. You will see these vehicles not only used as transport for goods but for passengers as well. * Go skiing: Yes, you can ski in South Africa! Head up to South Africa's highest resort, Tiffindell Ski Resort. This resort in the Eastern Cape, sits high up in the mountains at 2,720m and offers some exciting activities from skiing and snowboarding lessons to apres-ski fun. A great experience for the whole family! * Hike up mountains: In the Cederberg Wilderness area, only a two hours drive from Cape Town, you will encounter a landscape that is dramatically different. You will be amazed by towering mountains, rugged cliffs and huge boulders. Enjoy hiking up the rock formations or take leisurely strolls through blooming citrus orchards. Admire ancient San rock paintings, taste some local wine or even go stargazing at the open-air observatory at Sanddrift. * Experience Arts Alive Festival: Johannesburg annually hosts the fantastic Arts Alive festival during the month of September. As a major platform for young artists in South Africa the festivals brings a wide range of theatrical, dance, poetry and music performances. 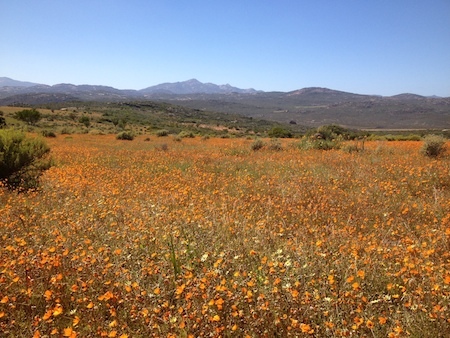 August is the time to experience the wonderful spring flowers in bloom in Namaqualand. Then wildflowers paint the otherwise dry landscape of this region in the Northern Cape in flamboyant colours. Namaqua National Park, as pictured above, is a easy day trip from Springbok. Daisies and other spring flowers in bright orange, pinks and yellows form vast carpets of colour attracting visitors from all over the world to admire this spectacular display. Stunning spring flower displays can also be admired in the Western Cape from late August to mid October. Many towns also hold spring flower festivals during this time. Days are usually sunny, however, be prepared to have some warmer clothes on hand, especially along the coast. More about spring flower festivals here. * Economy: The prime lending rate was raised in July to 9.25% due to the lower than expected GDP. The unemployment rate is also slightly higher with 25.5% in the second quarter of 2014. The inflation rate stands at 6.6% (June 2014) and is above the target range of 3%-6%. On a more positive note, global management consulting firm AT Kearney released its Foreign Direct Investment Confidence Index 2014, showing South Africa had climbed two spots and is ranked the 13th most attractive destination in the world among foreign investors. * Travel with Children: As we have advised previously, new immigration regulations came into effect on 26 May 2014. From 1 October 2014, new regulations will impact on families and persons travelling with children or unaccompanied travelling minors. For travel out of or into South Africa, all children will need to carry an unabridged birth certificate. Remember this will affect everybody, tourists, visitors, expats as well as South Africans. So if you are not in possession of an unabridged birth certificate for your child and plan to travel in the near future, apply for this document as soon as possible. This Saturday, 9th of August is Woman's Day. On this public holiday many celebrations will take place all over South Africa to remember the events which happened on this day in 1956 when 20,000 women, white and black, marched to the Union Buildings in Pretoria to protest with this song against the restrictive apartheid laws. Let us all remember these strong and brave women and celebrate the achievements of women and cherish the women in our lives. Make sure you join our new Facebook forum 'Living in South Africa' for regular updates and to share insights and tips on moving to and living in South Africa with other like-minded people.